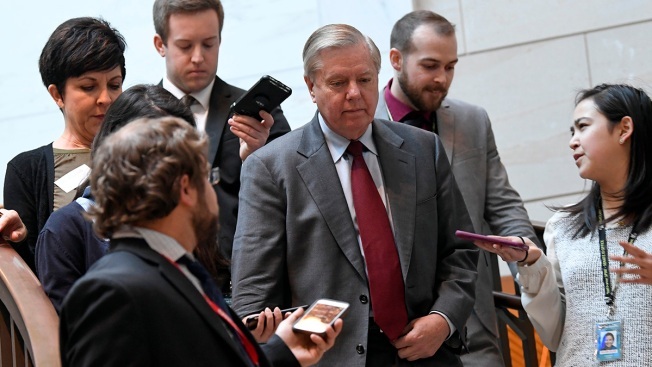 Sen. Lindsey Graham, R-S.C., is followed by reporters as he heads to a closed-door briefing on Capitol Hill in Washington, March 4, 2019, on the global Magnitsky Act investigation related to the killing of journalist Jamal Khashoggi. Senators left a closed-door briefing with Trump administration officials Monday deeply frustrated by the lack of new information on the killing of journalist Jamal Khashoggi, with some raising the prospect of placing new sanctions on the government of Saudi Arabia. Lawmakers had instructed President Donald Trump to order an investigation into Khashoggi's killing by invoking the Global Magnitsky Act. The request was made in October, which gave the president 120 days to respond. 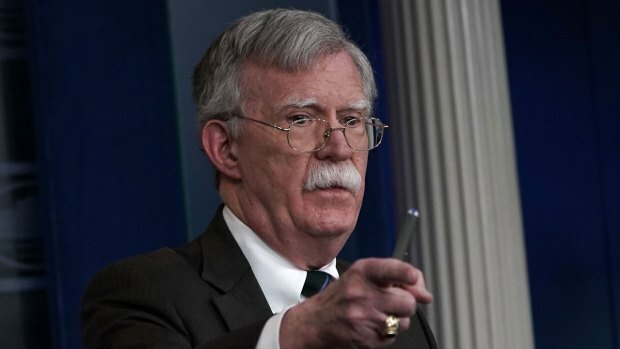 But the White House declined to submit a report by the deadline, angering members of the Senate Foreign Relations Committee. New Jersey Sen. Bob Menendez, the top Democrat on the panel, called the briefing "a farce" and said Trump still needs to give Congress an answer. "The law's very clear, there needed to be a determination," Menendez said. Democratic Sen. Chris Murphy of Connecticut said the briefing Monday contained "zero" new information. He criticized the lack of an intelligence official among the briefers, a move he described as "purposeful." "They don't want us to have a conversation about the intelligence," he said, referring to the White House. "These folks had no new information and were not permitted to give us any new information." Khashoggi, a writer for The Washington Post, was killed in a Saudi Arabian consulate in Istanbul last year by Saudi agents. 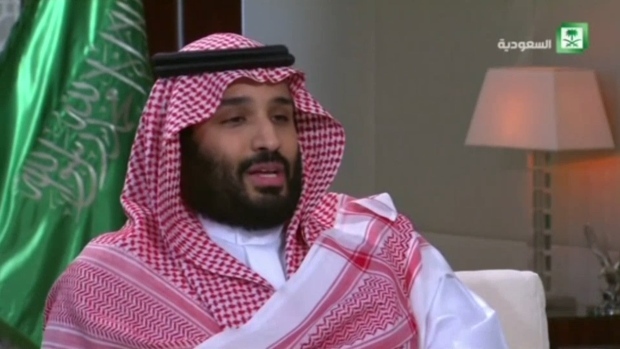 The Saudi government said the slaying was carried out by rogue operatives and denied Crown Prince Mohammed bin Salman had any involvement. Lawmakers have said they believe the Saudi crown prince ordered the killing, but Trump has been reluctant to place blame. Absent a determination from Trump, Menendez said the Senate has to do something, "unless it is willing to accept the death of a U.S. resident, a journalist." Republican Sen. Marco Rubio of Florida, another member of the committee, said, "The Senate will have to decide if it's going to impose its own sanctions"
The dispute over Khashoggi's death comes at a point of rising tensions between the White House and Congress over the U.S.-Saudi relationship, fueled in part by the Trump administration's involvement in Yemen's civil war. With U.S. weapons and logistical support, Saudi Arabia is fighting a protracted war in the country, creating the world's worst humanitarian crisis. After Khashoggi's death last year, the Senate passed a resolution with an overwhelming majority calling for the U.S. to end its support for the Yemen campaign, though that resolution did not pass the House. The Senate is expected to take up the issue again in the coming weeks, reviving the debate. While it's unclear if the Yemen resolution can again pass the Senate, members of both parties made clear they aren't moving on from Khashoggi. Sen. Jim Risch, the Republican chairman of the Senate Foreign Relations Committee, released a statement pledging the investigation would continue. "We will not let it go," he said. The Global Magnitsky Act of 2016 makes it possible to impose entry bans and targeted sanctions on individuals for committing human rights violations or acts of significant corruption.